Android includes Stagefright, a media playback engine at the native level that has built-in software-based codecs for popular media formats. Stagefright audio and video playback features include integration with OpenMAX codecs, session management, time-synchronized rendering, transport control, and DRM. Stagefright also supports integration with custom hardware codecs provided by you. To set a hardware path to encode and decode media, you must implement a hardware-based codec as an OpenMax IL (Integration Layer) component. Note: Stagefright updates can occur through the Android monthly security update process and as part of an Android OS release. Media applications interact with the Android native multimedia framework according to the following architecture. At the application framework level is application code that utilizes android.media APIs to interact with the multimedia hardware. The Binder IPC proxies facilitate communication over process boundaries. They are located in the frameworks/av/media/libmedia directory and begin with the letter "I". At the native level, Android provides a multimedia framework that utilizes the Stagefright engine for audio and video recording and playback. Stagefright comes with a default list of supported software codecs and you can implement your own hardware codec by using the OpenMax integration layer standard. 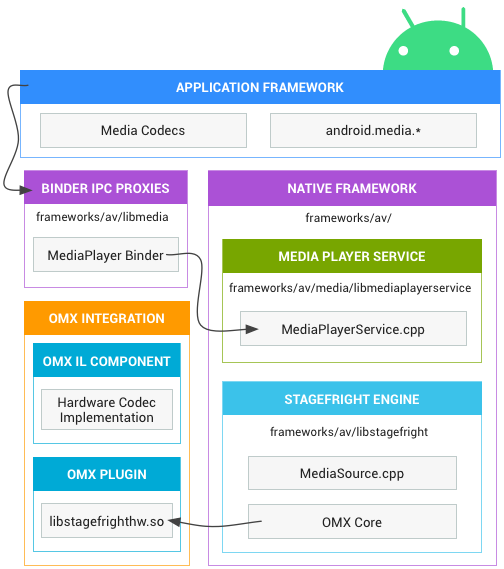 For more implementation details, see the MediaPlayer and Stagefright components located in frameworks/av/media. The OpenMAX IL provides a standardized way for Stagefright to recognize and use custom hardware-based multimedia codecs called components. You must provide an OpenMAX plugin in the form of a shared library named libstagefrighthw.so. This plugin links Stagefright with your custom codec components, which must be implemented according to the OpenMAX IL component standard. Stagefright comes with built-in software codecs for common media formats, but you can also add your own custom hardware codecs as OpenMAX components. To do this, you must create the OMX components and an OMX plugin that hooks together your custom codecs with the Stagefright framework. For example components, see the hardware/ti/omap4xxx/domx/; for an example plugin for the Galaxy Nexus, see hardware/ti/omap4xx/libstagefrighthw. Create your components according to the OpenMAX IL component standard. The component interface is located in the frameworks/native/include/media/OpenMAX/OMX_Component.h file. To learn more about the OpenMAX IL specification, refer to the OpenMAX website. Create a OpenMAX plugin that links your components with the Stagefright service. For the interfaces to create the plugin, see frameworks/native/include/media/hardware/OMXPluginBase.h and HardwareAPI.h header files. For complete examples, see device/samsung/tuna/media_codecs.xml and device/samsung/tuna/media_profiles.xml . Note: As of Android 4.1, the <Quirk> element for media codecs is no longer supported.